'Silver Queen' is a lovely white variegated male form of holly - despite it's feminine name! Its densely packed spiky leaves really seem to come to light when the leaf edge colour is brightest. Male hollies do not produce berries, but are important as pollinators for female forms - such as 'Golden King', which do bear the berries. A beautiful, gardenworthy evergreen shrub in it's own right, providing all year round foliage and colour interest, and shelter from winds as it is a dense growing shrub. Supplied as a bushy, well branched 3 year old plant in a 1L pot, 25-30cm tall to plant straight out. 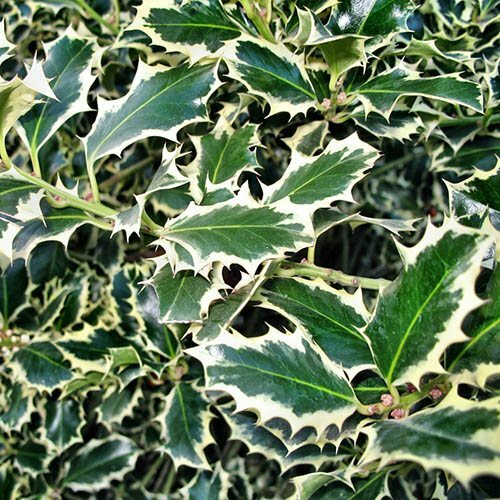 'Silver Queen' is a lovely white variegated male form of holly - despite it's feminine name! It's densely packed spiky leaves really seem to come to light when the leaf edge colour is brightest. Male hollies do not produce berries, but are important as pollinators for female forms - such as 'Golden King', which do bear the berries. However, it is a beautiful and gardenworthy evergreen shrub in it's own right, providing all year round foliage and colour interest, and shelter from winds as it is a dense growing shrub.